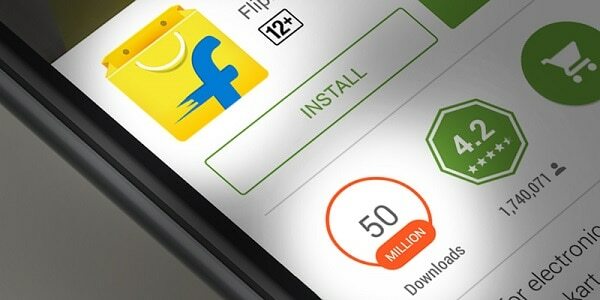 India’s top online shopping store Flipkart has becomes the first Indian app to cross 50 million downloads on Google Play Store. With an average rating of 4.2/5 stars from 1,74k reviewers, the app are among the highest rated Indian shopping app on Google Play store. Flipkart android app has achieved this milestone during the first week of February 2016. Flipkart, having a net valuation of more than $15 billion and India’s leading E-commerce Company. The company launched its android app in Sep 2013 and has achieved the feat in less than 30 months. Flipkart app comes with numerous unique and innovative features like the Ping messenger, image search, smarter search, one-touch wishlist, multi-filter functions and more. Flipkart has a customer base of 50 million, with 80,000 registered sellers on its platform, retailing 30 million products in more than 70 categories. A SimilarWeb report ranked Flipkart as India’s number one shopping app with 47% of the share of visits. The report also stated that the combined traffic share of Flipkart and Myntra stood at 63%. Amazon was in the third position with 15.86% followed by Snapdeal with 13.84%. The big success for Flipkart may be due to their earlier decision to go all route to the app while closing down their mobile website and forcing customers to install the app to browse the website on mobile. In addition, they also try to lure customers to install the app by offering app-only offers. Furthermore, the burst of low cost and affordable android smartphones in India has helped Flipkart to quickly reach more users. Recently Flipkart brought back its mobile version of the website on smartphones called Flipkart Lite with advanced Chrome integration. [su_box title=”More From DSIM” box_color=”#c7c7c7″ title_color=”#000000″ radius=”5″]1) STARTUP: How Cityfurnish is trying to revolutionize the furniture rental industry?